Entry Fee: Euro 150 per bird. A team of10 pigeons is entitled to a bonus prize money of Euro 5,000 if the team wins the Team in Championship. Identity of each team members is fixed and not interchangeable among teams once registered. An initial fee of Euro 150 per one team of ten birds must be paid when the birds are collected. For example, sending 1 bird up to 10 birds requires 150 Euro deposit. 11 up to 20 birds is subject to the initial fee of Euro 300. This initial fee is not refundable. The rest of the entry fee for the remaining team members which return within four days from the first 100-km qualifying flight is payable no later than 7 days after the results are shown in the www.one-loft-race.net. This 100-km qualifying flight will be staged within the first half of November 2019. Late arrivals after the fourth day shall be deactivated and become property of the organization unless the owner or a third party activates the birds by paying the entry fee within ten working days before the first Hot Spot race. Birds will be accepted to the loft until May 31, 2019. Total admission to the loft is limited to 2,700 birds (on first come first served basis except for pigeons already in transit from overseas). Import tax, local transportation, customs clearing charge, fees, etc., amounting to approx. Euro 40 per bird shall be borne by the organisers. The pigeon that has the lowest sum of coefficients from all the three races shall be declared the first ACE pigeon. The winner is the pigeon that can score five positions among the first 300 birds in each of the five races which includes Hotspot1, Hotspot 2, Final race and the two longest training flights from over 200 km. In case of a tie, the pigeon which has the lowest summation of all positions will be the winner and entitled to the trophy and Euro 500 cash prize. A team of 10 pigeons shall win the Euro 5,000 bonus if it can accumulate, from all three races, the highest number of prizes won, or rankings listed within the first 15 % of the number of pigeons competing in each race. If there are more than one team of equal number of prizes won, the team that has the lowest summation of all prizes is the winner. Trophies will be given to the first three positions in each race and the ACE pigeons. Certificate of achievement will also be issued to all pigeons that have won prizes in all competitions. The Royal Cups, once approved, shall be awarded to winners of important races as shall be prescribed by the authority. Farewell Party and Award Presentation ceremony will be staged in the evening of January 9th. Auction of about 30 top prize winners and ace birds will also be done on this occasion. Any change of dates or program due to unexpected circumstance, if any, shall be duly announced in advance. 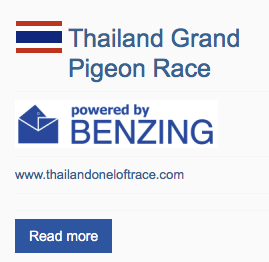 The birds will be released from the north-east direction to Bangkok for all the three races. Note: The foreign exchange rate applied for both entry fee and prize money is fixed at Bhat 40 per Euro 1.00. Proceeds from auctions net after deducting all bank charges, will be paid to foreign participants in Euro at the prevailing exchange rate on the date of the transaction. The money will be paid to owners collectively via their respective coordinators/collectors. Owners are responsible for 5% withholding tax on money received, if applicable. There is no limit for individual entry, but total loft admission is limited at 2,600 birds. 2. All pigeons must wear year 2019 life rings and must be at least 40 days old before sending to TGPR loft. 3. No foreign life ring is allowed for any bird bred locally unless declared as a local entry. 4. Closing time of the two hotspot races is 6.00 p.m. of the first race day. For the final race, the closing time is 6.00 pm of the second race day. 5. The first 150 pigeons and past winners or ace birds that successfully return in the final race will be auctioned and the proceeds shall be shared 60% by the owners and 40% by the organization. Pigeons that come back after the first 150 positions shall be retained and dispensed out at the discretion of the organization. 6. The organizer reserves the right to reschedule or alter training and racing distance, race dates and race closing time as could be necessitated by circumstance or other factors. If there is a situation that is not anticipated or not covered by the existing rules/regulation, ruling by the organizer shall be deemed final.7. All birds must be vaccinated against paramyxo by dead vaccine (and pigeon pox if possible) at the age of 21 days or at least 14 days before leaving the loft. The birds will be vaccinated again upon arrival, health condition permits. 8. Pedigrees all winning birds return from the second hot spot race must be sent electronically and followed by hard copies to the organisers before the basketing for the final race. Birds without pedigree in the auction may not receive their share of money from the auctions.